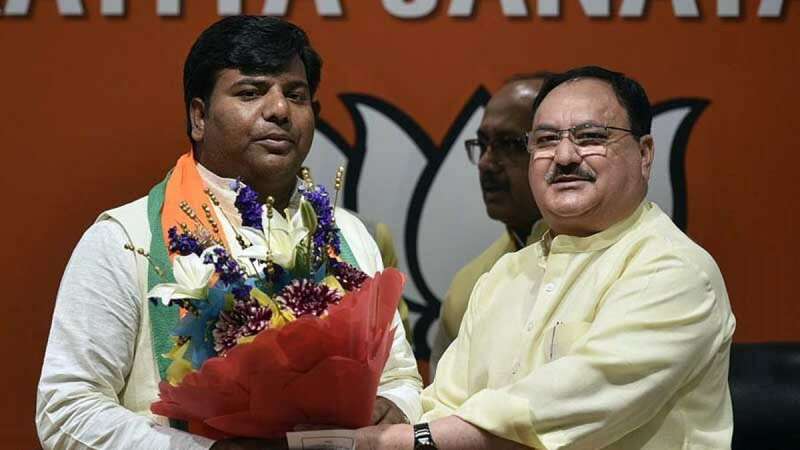 Lucknow : Bharatiya Janata Party got a boost in Uttar Pradesh for the upcoming Lok Sabha Election 2019 as Nishad Party leader and Gorakhpur Lok Sabha MP Praveen Nishad joined the Saffron party. Praveen, the son of party president Sanjay Nishad, joined the party in the presence of Union Minister JP Nadda. "The entrance of the Nishad Party will impact several Lok Sabha seats in eastern, western and central Uttar Pradesh," Nadda said at a press conference at the party headquarters. Nadda did not announce any seat-sharing pact with the new ally. He, however, signalled that Praveen may contest the Lok Sabha elections. "Since he is in electoral politics, he will contest the polls," he told reporters. Nishad Party President Sanjay Nishad said that they are in alliance with BJP and work in favour to ensure a second term for PM Narendra Modi. Praveen Nishad had defeated the BJP candidate from Gorakhpur, the home turf of UP Chief Minister Yogi Adityanath, in the 2018 Lok Sabha by-elections.